This weekend at Ginghamsburg we did something we don't usually do; we brought in a guest speaker. Not just any speaker, a big time name in the Christian world. This type of move comes with a certain risk/reward. If he is great then it was worth it, but let's be honest, you only get 52 weeks in a year. No one wants to have a bad week. So the risk is as equally as big as the reward. I had heard the hype going in, I heard that this man was a profound speaker as well as someone who could get the crowd moving. I wasn't disappointed. Tony Campolo was an amazing speaker and dropped some Kingdom knowledge that I won't soon forget, but there were some things I learned from him that are great reminders for my own everyday life. 1. Comedic timing is everything. Wow, can that man deliver a joke or what? I was so impressed with how flawless he integrated humor into his sermon. At one moment I found myself wondering if I was in a comedy club or a church. I think his material is good, but his timing was great. He did a fantastic job of letting the joke sit out there for a moment before delivering the punchline. Creating space for humor to breathe is a critical part of speaking success, it would serve me well to slow down and let the joke do the work. 2. He never opened a bible. I have to admit, I wrestle with this one. As someone who feels called to preach the Gospel I think scripture is important to have as that key reference point. As I reflected on his message a little more what I found was while he never opened the bible, he certainly preached the Gospel. I also think that when you are crystal clear on what your message is the words almost preach themselves. He quoted Isaiah 65 from memory, and he pretty much nailed it. 3. Passion, you gotta have passion. 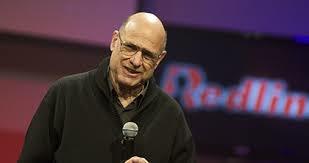 Tony Campolo is the youngest 78 year old I have ever seen. His energy on stage was palpable. I could feel how important this message is to him. His passion said, "If I don't tell you this message I'm going to explode." I hope and pray that at the age of 78 I am still as passionate about sharing the Gospel as I am today. Those are my thoughts, but I would love to hear from all of you. Take a second to answer the questions below on my facebook page or in the comment section. Thanks! What did you learn from Dr. Campolo? Would you be happy still doing your job at 78? Did you miss the sermon this past weekend? You can check it out here. Mar 2 What can mere mortals do to me?